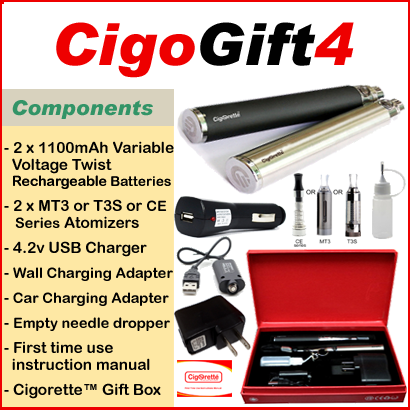 CigoGift4 from Cigorette Inc contains two variable voltage Twist 1100 mAh e-Go technology rechargeable batteries. Also, it has two atomizers of 2.7-ohm resistance each, 4.2 volt USB charger, wall charging adapter, Car charging adapter. In addition to, empty stainless needle dropper, and first-time use instructions manual. CigoGift4 is available in Cigorette™ elite gift box. 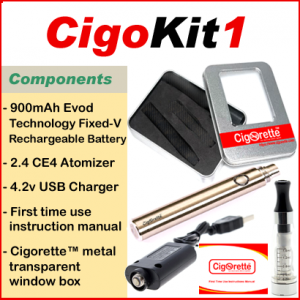 CigoGift4 Kit from Cigorette Inc contains two variable voltage Twist 1100 mAh e-Go technology rechargeable batteries. 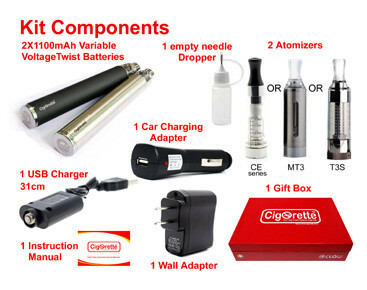 Also, it has two atomizers of 2.7-ohm resistance each, 4.2 volt USB charger, wall charging adapter, Car charging adapter. In addition to, empty stainless needle dropper, and first-time use instructions manual. Each battery in this kit features a five click on and off power control with a variable controllable voltage from 3.2 to 4.8V. Also, it has a 510 threading connector that makes it compatible with CE4, CE5, CE6, Vivi Nova, Mt3, T3S, T3D, DCT, and few other brands of atomizers. The battery has an estimated charging time of 2.5 to 4 hours. Moreover, it gives the user around 1300 puffs after a full charge and has almost 400 times charging lifespan. Finally, CigoGift4 is available in Cigorette™ elite gift box. 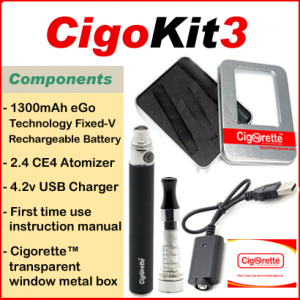 Hey Buddy!, I found this information for you: "CigoGift4". 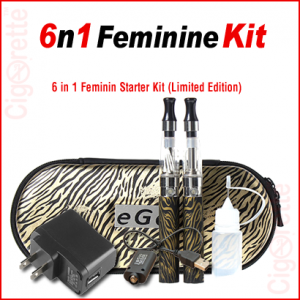 Here is the website link: //www.cigorette.com/shop/kits/cigogift/cigogift4/. Thank you.